Home political news Psychological Operations in Darjeeling? Darjeeling woke up yesterday to once again witness the enigmatic posters signed by ‘janta’. The posters did not deviate too much from the usual bashing of Bimal Gurung and Roshan Giri, but also included West Bengal’s Bharatiya Janata Party (BJP) leader, Mukul Roy. The posters warned Gurung and Giri that they would face dire consequences if they returned, and dared Roy to campaign for the BJP in the hills. What was notable this time were the specific references to ‘appa’, the name people used when referring to the late Subhash Ghising, the former supremo of the Gorkha National Liberation Front (GNLF). Gurung and Giri were accused of preventing Ghishing’s wife’s body from being brought to the hills for the funeral rites. In 2007, Gurung, who was then Ghising’s right hand in the GNLF, rebelled against his boss, accusing him of selling out the Gorkhaland dream. One of the main issues on which Gurung challenged Ghising was on the Sixth Schedule status for the Darjeeling hills. Gurung argued that accepting Sixth Schedule status would dilute the Gorkhaland demand. The result was that Gurung and his supporters drove Ghising and his lot out of the hills. Ghising spent the rest of his days in Siliguri. Gurung subsequently launched the Gorkha Janmukti Morcha (GJM), ostensibly to push for the demand of creating the Gorkhaland state. Following the internecine violence and the GNLF’s ouster, Darjeeling maintained a tentative peace enforced by the GJM, predicated on the condition that there should be no challenge to their diktat. This broke down in 2017 when the GJM’s position was challenged by several events. Firstly, Harka Bahadur Chettri broke away from Bimal Gurung, and launched the Jan Andolan Party (JAP). Secondly, Kalimpong which had existed as a sub-division of Darjeeling became a district. 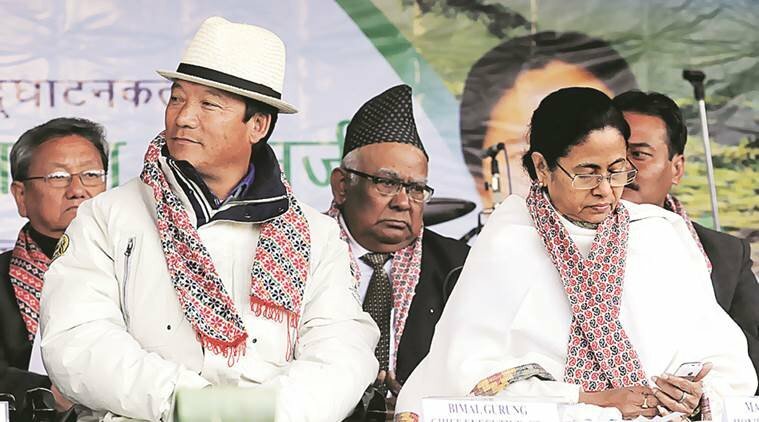 Thirdly, for probably the first time since the Gorkhaland movement began, a non-hill party won an election, as the Trinamool Congress won the Mirik municipal elections. These may have been the contributing factors to the GJM declaring the shutdown on June 12, 2017 which went on to last a staggering 105 days. Though the immediate trigger was the fear that Bengali would be made compulsory in schools in the hills at the expense of Nepali. However, Gurung may have outplayed himself. The result of the agitation was a nearly bloodless transfer of power from Gurung and Giri to Anit Thapa and Binay Tamang, both members of the GJM. The situation, at present, however, does not resemble 2007 to the extent that no new party has been launched in opposition to the GJM. However, since Thapa and Tamang were both appointed by the TMC government of West Bengal, there is a perception that they are simply the pawns of Kolkata. Thus, in this apparent lack of popular legitimacy, the GNLF has begun to return to the hills. This turn of events may lead one to believe that the GNLF were the ones to put up the posters. However, there are a few things that do not add up. Firstly, on November 12, the GNLF began a renewed agitation for Sixth Schedule status. Secondly, they have denied having any role in the posters, and have stated that if they were to put up such posters, they would do so on their letterhead, and mention the party name. The next suspects then may be the Thapa and Tamang-led GJM, since they would benefit by discrediting Gurung and Giri. However, considering that many of the present GJM leadership – whether on the run or not – participated in the anti-GNLF violence, such a gambit would certainly not be in their interest. At this point, it may be worth mentioning that the Darjeeling unit of the TMC on the same day of the posters appearing held a press conference in Darjeeling demanding that the Gorkhaland Territorial Administration (GTA) elections be held at the earliest. They suggested January as a good month for holding the elections, as it would not clash with the exam schedule of schools and colleges. From the TMC’s perspective, holding the GTA elections at the earliest – before the 2019 Lok Sabha polls – may be an opportunity to test the waters, and keep the BJP out. The BJP has won two consecutive Lok Sabha elections from Darjeeling based on support from the GJM. The GJM in turn probably saw the BJP as the best choice since it was during a BJP government’s time that Jharkhand, Chhattisgarh and Uttarakhand were created. However, following the end of the 2017 agitation, the Thapa-Tamang faction seems to have had a falling out with the BJP. The TMC has not been complacent since the shutdown ended. Gurung and Giri’s names were struck from the voter rolls in July this year. Thus, neither of them can vote or contest elections in Darjeeling. However, due to the alleged tacit support from the BJP, neither Gurung nor Giri have been apprehended despite the numerous First Information Reports (FIRs) filed against them. Therefore, their return to the hills may be possible with the help of the saffron party. On the other hand, the Thapa-Tamang faction has a credibility problem and would likely suffer in the event of an election. The only problem for the TMC is the growing popularity of the GNLF which can be countered by reminding people of the ‘dark days’ of Ghising’s reign. A TMC victory in the GTA elections would be a blessing for Kolkata. Not only would they be in a greater position to suppress the Gorkhaland movement, but they would also be in a stronger position to prevent a BJP Lok Sabha win. However, considering the manner in which the politics in the hills have been reconfigured, a BJP win is unlikely without muscle. Darjeeling woke up yesterday to once again witness the enigmatic posters signed by ‘janta’. The posters did not deviate too much from the usual bashing of Bimal Gurung and Roshan Giri, but also included West Bengal’s Bharatiya Janata Party (BJP) leader, Mukul Roy.